January 6, 2017 – NASA’s Hubble Space Telescope has discovered comets plunging into the star HD 172555, which is a youthful 23 million years old and resides 95 light-years from Earth. The exocomets — comets outside our solar system — were not directly seen around the star, but their presence was inferred by detecting gas that is likely the vaporized remnants of their icy nuclei. 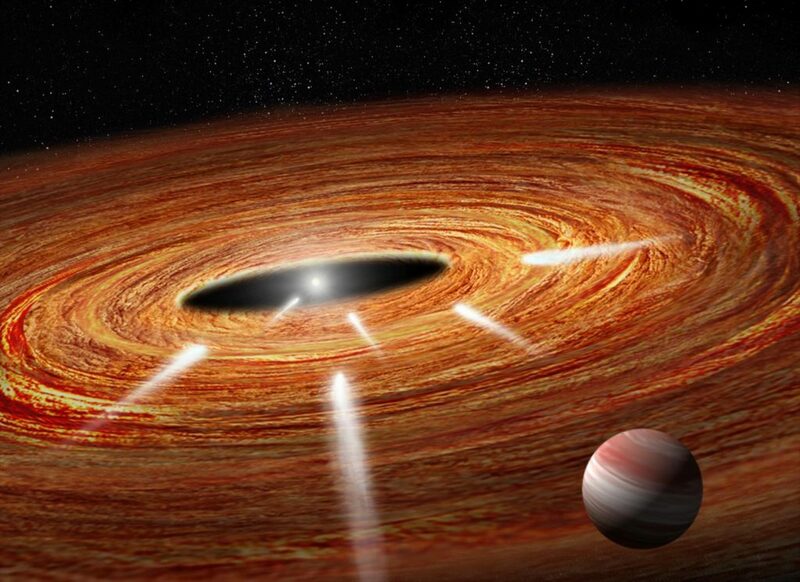 Astronomers have found similar plunges in our own solar system. Sun-grazing comets routinely fall into our sun. Grady presented her team’s results January 6 at the winter meeting of the American Astronomical Society in Grapevine, Texas. The stellar group is important to study because it is the closest collection of young stars to Earth. At least 37.5 percent of the more massive stars in the Beta Pictoris Moving Group either have a directly imaged planet, such as 51 Eridani b in the 51 Eridani system, or infalling star-grazing bodies, or, in the case of Beta Pictoris, both types of objects. The grouping is at about the age that it should be building terrestrial planets, Grady said. A team of French astronomers first discovered exocomets transiting HD 172555 in archival data gathered between 2004 and 2011 by the European Southern Observatory’s HARPS (High Accuracy Radial velocity Planet Searcher) planet-finding spectrograph. A spectrograph divides light into its component colors, allowing astronomers to detect an object’s chemical makeup. The HARPS spectrograph detected the chemical fingerprints of calcium imprinted in the starlight, evidence that comet-like objects were falling into the star. As a follow-up to that discovery, Grady’s team used Hubble’s Space Telescope Imaging Spectrograph (STIS) and the Cosmic Origins Spectrograph (COS) in 2015 to conduct a spectrographic analysis in ultraviolet light, which allows Hubble to identify the signature of certain elements. Hubble made two observations, separated by six days. Hubble detected silicon and carbon gas in the starlight. The gas was moving at about 360,000 miles per hour across the face of the star. The most likely explanation for the speedy gas is that Hubble is seeing material from comet-like objects that broke apart after streaking across the face of the star. Hubble gleaned this information because the HD 172555 debris disk surrounding the star is slightly inclined to Hubble’s line of sight, giving the telescope a clear view of comet activity. Grady’s team hopes to use STIS again in follow-up observations to look for oxygen and hydrogen, which would confirm the identity of the disintegrating objects as comets. The Space Telescope Imaging Spectrograph (STIS) is one of several instruments built for Hubble Space Telescope by Ball Aerospace in Boulder, Colorado. The Cosmic Origins Spectrograph was designed and built in Boulder by the University of Colorado’s Dr. Jim Green and team. Fabrication, integration & testing was performed by Ball Aerospace.